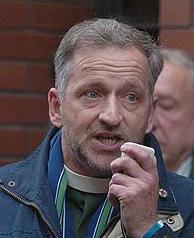 The BNP in the East Midlands has achieved 106,319 votes in the European elections and came fifth, so the Rev Robert West – who believes that the “mixing of races” is a sin against God due to divinely-ordained “physical, intellectual and character” differences – will not be going to Europe as an MEP. The defeat was not due to the Christian Party, which had preposterously declared itself to be the only party able to win against the BNP – they got a very un-macho 17,907 votes in the region, and appear to be cruising to irrelevance across the country. …the Church of England as a ‘vile perverts organisation’ and…to C of E Bishops as ‘pompous, self-righteous windbags … renowned for interfering with young boys’. The actions of a couple of other churches have sadly been less impressive than the Church of England’s position: prior to the election, West was invited into the pulpit of a historic chapel in the village of Barton-in-the-Beans; the chapel is affiliated to the Fellowship of Independent Churches, but beyond a private assurance to a Messianic Jew that they were opposed to West’s views the FIEC declined to make any public statement. The Apostolic Church, which ordained Rev West in the 1970s, could also have done more to undermine West’s credibility: the denomination did repudiate any link to West a couple of years ago in an email to a blogger which I fortunately reposted (the original blog has gone) and I was able to mention this when the BBC asked me for a soundbite, but again no public statement was forthcoming – even after West displayed his ordination certificate on the BBC Politics Show. Both men have disreputable far-right and racist pasts; Griffin’s is well-known, and more about Brons can seen here. Brons has a background in Colin Jordan’s anti-Jewish “National Socialist Movement”, and in 1984 he “was convicted of behaviour likely to cause a breach of the peace following his arrest in Leeds while selling papers in a shopping centre.” Although doubtless someone might suggest that such old political antics ought not to be raked up, I hope most people will agree that they are significant and belong in the public domain. So, what’s happening with Jim Barfield, whom I blogged on here? Barfield, it may be recalled, is a former arson investigator who recently briefed Oklahoma state senators concerning his claim to have deciphered clues in the ancient “Copper Scroll” that would lead to the recovery of treasure lost from the First Temple in Jerusalem, including perhaps the Ark of the Covenant. He then headed off to the Judaean Desert, to the great excitement of apocalyptically-minded Christian Zionists. We are in the process of putting together a DVD that will contain that disclosure in detail with additional graphics and photos from each location. Once the video is complete it will be sent to only select individuals in power in Israel…If you know people in power in Israel that might be of assistance, send me their NAME, GOVERNMENT POSITION, ADDRESS, PHONE, and EMAIL ADDRESS. My greatest concern is what will the people in power do if adequate testing is done and a find is made? These items are not meant to bolster the national economy or to be added to the national treasury of Israel, it is a dowry meant for the time of G-d’s kingdom and for that purpose only. But then…that is where faith in G-d comes in for all of us who believe. Do we shrink from the possibilities or gather our five smooth stones. “laid claim” to the most important [site] of all. If we have actually located the buried cave, that site is now under his control and he has priority for digging at that location preventing others from digging without the involvement of the proper authorities. We can the return to the site and finish excavating to the proper depth to expose that cave opening. With that in mind, we can go to those in authority with the credibility that we have established and disclose our plan.